Tom DiNardo recently made his debut as the featured "celebrity auctioneer" on TLC's new hit television program "Wrecks to Riches". Auctioneer Tom DiNardo skillfully guided the competing bidders into new record territory, and The "Exterminator" sold for a record high of over $81,000 dollars. Tom DiNardo recently made his debut as the featured "celebrity auctioneer" on TLC's new hit television program "Wrecks to Riches". Episode number five of the 2007 Wrecks to Riches television series was filmed at the annual "Twilight Cruise" held at the National Hot Rod Association's (NHRA) Wally Parks Motorsports Museum in Pomona, CA. This event was organized by Cal-Rods Car Club on behalf of the museum and was open to owners of hot rods, customs, classics and muscle cars predating 1970. The gem of this year's NHRA sanctioned event was the featured Barry's Speed Shop custom built "Exterminator" Hot Rod which was to be auctioned off by Tom DiNardo later that evening. The 2007 Wrecks to Riches television series will feature ten episodes that guide viewers through the dramatic process involved in transforming "junkers" into some of the nation's most loved and sought after classic cars, muscle cars and hot rods. This 2007 Wrecks to Riches episode chronicles over a four week period the laborious efforts taken by Barry White and his speed shop crew in order to build and completely restore this once "past its prime" 1957 Chevy Gasser to perfect, collector car condition at Barry's Speed Shop in Corona, CA. The "Exterminator" was built to be street legal. It features the appeal of an old school look combined with state of the art technology as found in the new Chevrolet big block 427 engine, the fuel injection system and custom exhaust. Great attention to detail was also spent on designing the unique upholstery, premium candy apple red paint job, 24 karat gold gilt lettering, and the rare red tinted glass windows. The car was test driven at the Camarillo Airport on the runway just before it was sold at this year's auction. 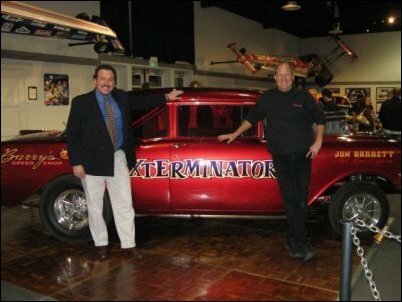 This particular Wrecks to Riches episode featured celebrity auctioneer Tom DiNardo of DiNardo & Lord Auctioneers selling the "Exterminator". Mr. DiNardo worked the crowd into a bidding frenzy and set a new financial record for a Barry's Speed Shop car sold at auction. The previous record high for one of Barry White's collector cars was $76,250 dollars. Auctioneer Tom DiNardo skillfully guided the competing bidders into new record territory, and The "Exterminator" sold for a record high of over $81,000 dollars. Tom DiNardo is the founder of the nationally recognized fundraising auction firm DiNardo & Lord Auctioneers. 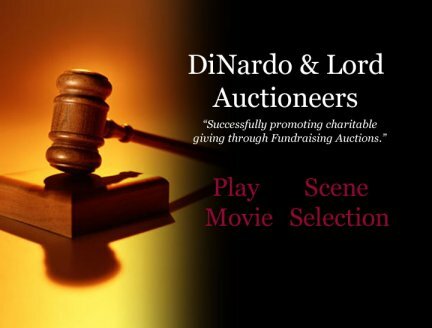 DiNardo & Lord Auctioneers is ranked as one of the country's "Top 4 fundraising auction companies". Since 1993 they have specialized in charity auctions, and Tom DiNardo has helped to pioneer the newly emerging niche - charity wine auctions. Mr. DiNardo has presided over more than one thousand charity auctions for various non-profits, charities, and community organizations within the United States. Tom holds five world records for the financial results attained for items sold at benefit auctions. He is a freelance writer for Wine Enthusiast, Wine Adventure and Sante magazines, AuctionZip.com, GlobalAuctionGuide.com, and he is a regularly featured writer for Winesquire.com. In addition to his notable career as an accomplished auctioneer, Mr. DiNardo is also a certified appraiser, sommelier candidate with the International Sommelier Guild, a wine consultant and educator, and a member of the Association of Fundraising Professionals (AFP) and the NAA.